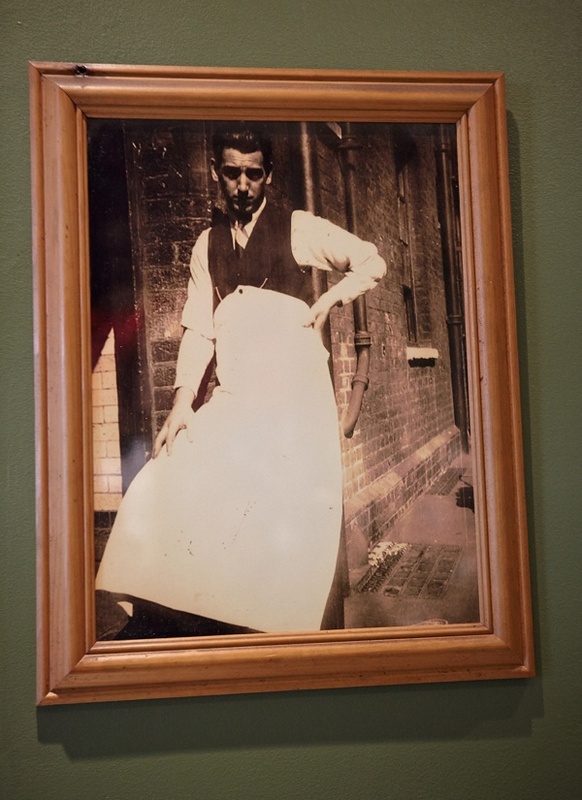 Behind a curious concrete staircase that leads nowhere on Middlesex St, you will find MB’s Cafe with faded old photographs upon the walls of Baldacci’s Cafe. 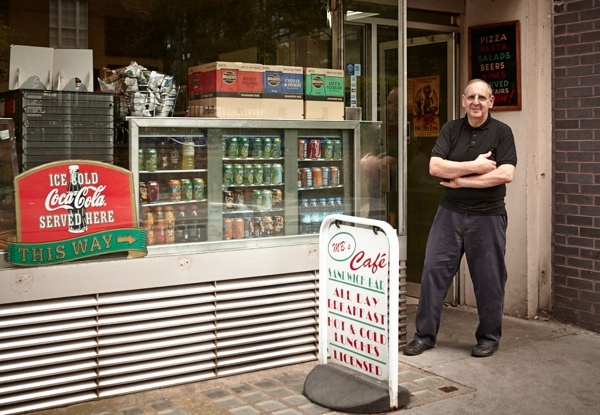 M B stands for Matthew Baldacci who runs this cafe and another of the same name round the corner in Harrow Place with his father Peter. Together they are the second and third generations in this family business, begun here by Matthew’s grandfather Umberto. 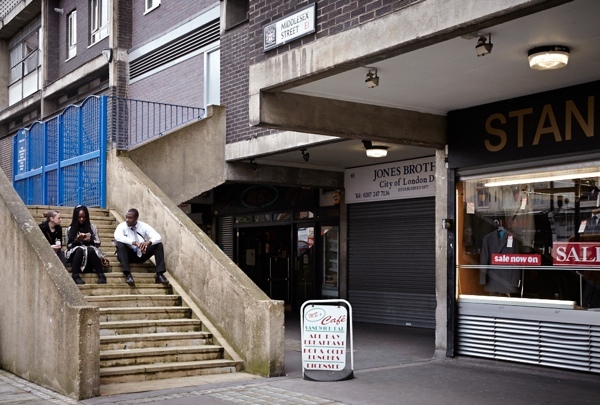 The original cafes and the street in the photographs where Umberto lived and worked have long gone, lost beneath a brutalist concrete development – the one with the staircase leading nowhere. 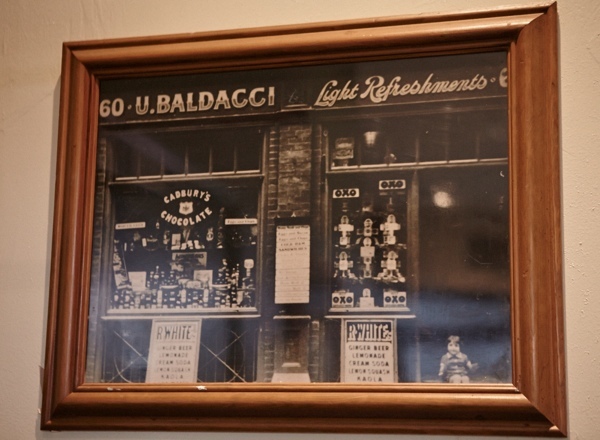 Yet in spite of this architectural transformation, the Baldacci family and their cafe remain to carry the story of the Lane. 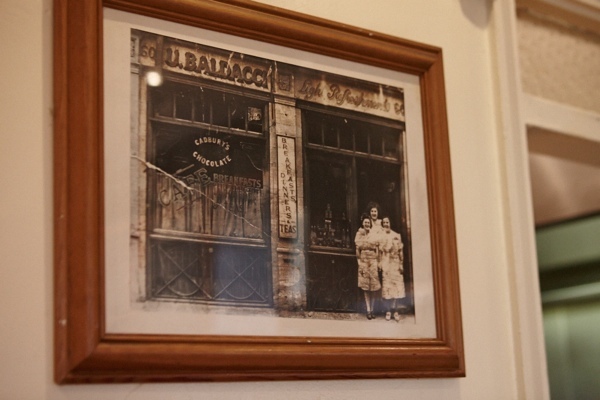 Reflecting the nature of this border territory where the City of London meets the East End, the two Baldacci cafes are oriented to serve customers from both directions. 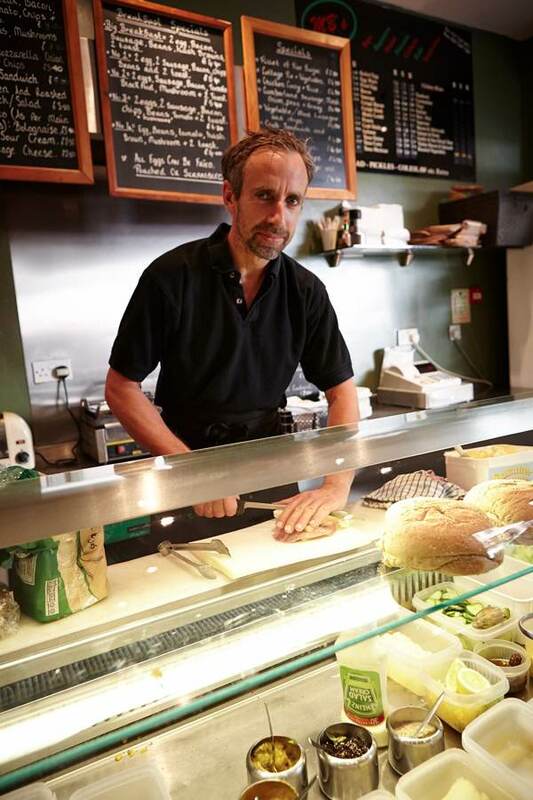 MB’s in Harrow Place is where Matthew greets the City workers by name as they pick up their sandwiches and rolls daily, while MB’s in Middlesex St is where you can find the stalwarts of Petticoat Lane tucking in to their cooked lunches. It was at the latter establishment, hidden discreetly under the stairs, that I met with Peter recently and he filled me in with the Baldacci history. I do hope the two cafes survive all the changes happening in the area – good luck to the Baldacci family for a long and successful future. The ‘staircase to nowhere’ used to lead to the public gardens on Petticoat Square, now closed off to allow extra homes to be built and making the gardens private for residents. They couldn’t demolish the steps as it houses an electricity sub-station supplying the estate. I love reading about family businesses that have been going for generations. Long may the Baldaccis continue. Those steps may not lead anywhere now but they’re put to good use by BMX-ers and skateboarders. I’ve been getting my toast at MBs for over ten years now. But never knew the history – fascinating. Interesting. Thank you. My grandfather ran bakers shops there. My father grew up. Next to the kings stores. They were there from 1920 for about 20 years I think. Other shops were around London. Ripper murders. I love history. 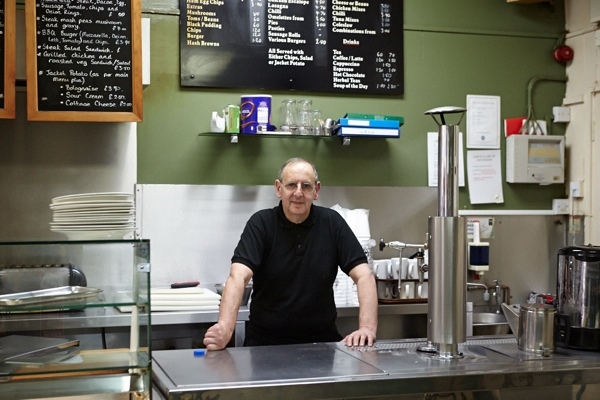 I’ve worked in St Mary Axe for 22 years, and Pete’s sausage and egg sandwiches are the best, bar none. Many more years of successful trading to Peter and Matthew. I have known the family for a good 25 years plus used to eat there as an apprentice and would bump into Matty at the villa in Gant Hill and other fine watering holes in Redbridge. 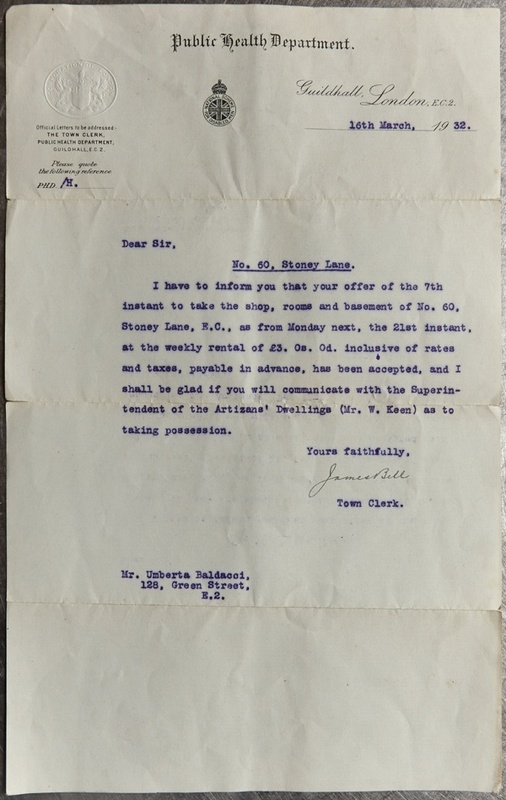 I am very sad to let you all know but the greedy short sighted folk at the Corparation of London have forced the fine Baldaccis from their places of buisiness by trying to double the rents and come up with ludicrois deposits .Indeed theitr last day of serving was Friday the 27th of Febuary2015. Another shortsighted closure of a well respected nay historic establishment which will know doubt be replaced by another Itsu, Pret,Costa etc etc faceless chain which we of course dont have enough of in the area already .. Shame on you to drive a family that pays its way employs 7 people and was a delight to use.London will be a poorer place with out them . I wish you well Peter and Matt you are missed already !! 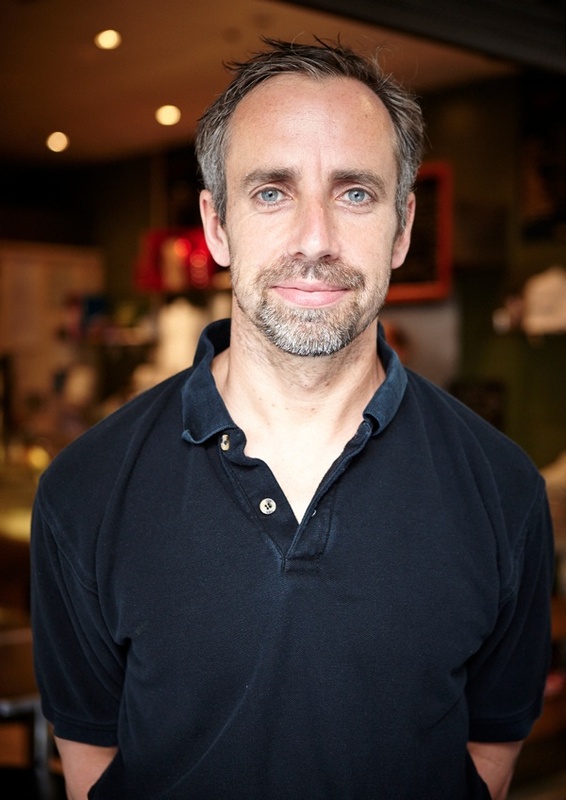 We were shocked and saddened yesterday to find our favourite London cafe had closed. We discovered from our taxi driver that this was due to the excessive greed of the London Corporation in what must be one of the wealthiest parts of our planet – shame on them. Our twice yearly visits over the past 25 years have been the only bearable part of our trips to London to visit Moorfields Eye Hospital. Good luck guys. It’s a real shame that this place has closed; it was a little gem. I guess the smaller, local businesses that exist in this area will start to feel the pressure when the leases are up for renewal. I do not think that there’s another breakfast which can match up to a good hearty no.2. Very interesting article. 11 years of going into Mr Bs / MBs so shocked to suddently find that it has closed. Very sad to think of the link to the past ending. 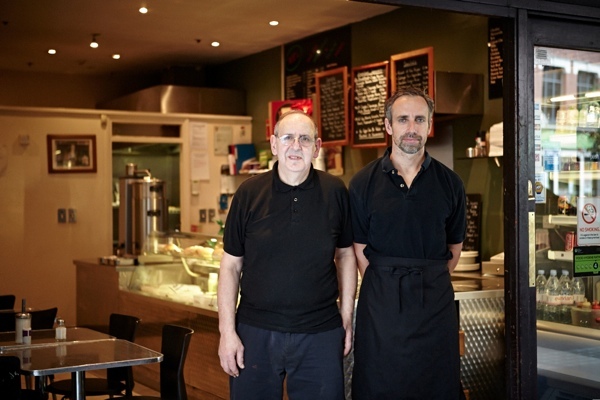 Wishing the staff good luck for the future and hopefully Peter and Matthew can come back fighting in a new premises.